SNES Donkey Kong Country 2: Diddy's Kong Quest (USA) "102%" in 1:23:10.88 by NxCy & Comicalflop. 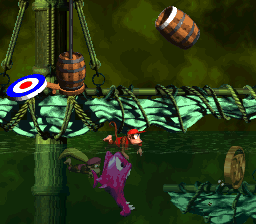 Donkey Kong's been kidnapped and old Cranky Kong insists that Diddy collect a bunch of coins that say "DK" on them. These goals are sufficiently compatible that Diddy and Dixie decide to get a little bit sidetracked on their rescue plan. This run abuses a lot of bugs with regard to motion and collision detection. Read the authors' submission to learn more. This run improves the previous one by more than 5 minutes thanks to new tricks, new glitches, and greater precision.